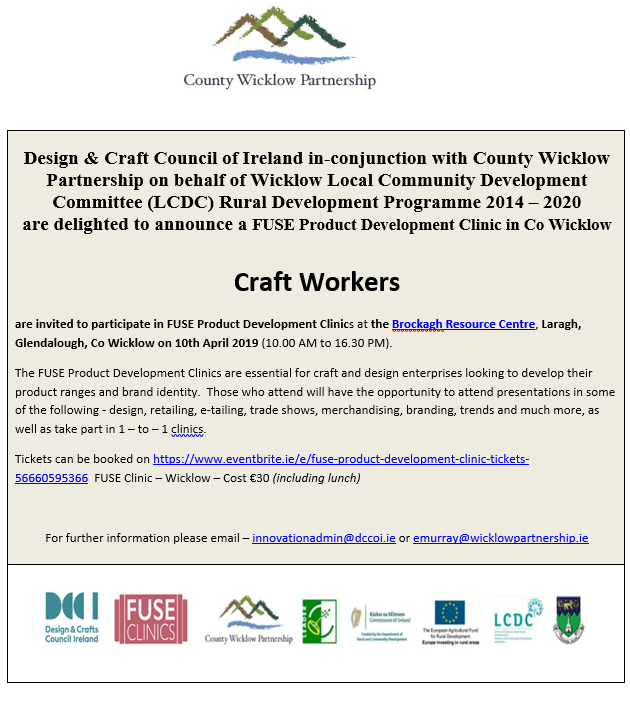 Craft Workers are invited to participate in FUSE Product Development Clinics at the Brockagh Resource Centre, Laragh, Glendalough, Co Wicklow on 10th April 2019 (10.00 AM to 16.30 PM). The FUSE Product Development Clinics are essential for craft and design enterprises looking to develop their product ranges and brand identity. Those who attend will have the opportunity to attend presentations in some of the following – design, retailing, e-tailing, trade shows, merchandising, branding, trends and much more, as well as take part in 1 – to – 1 clinics.